Tablet form factor computers are undoubtedly an exciting way to interact with technology, especially, when they are touch screen enabled. The intimacy and immediacy of the personal screen and the ease of use and intuitive design of modern touch screen operating systems greatly eases user fears and facilitates user adoption. This ease of use is exciting technologists and educators, both of whom are thinking of new ways to use technology like the iPad in educational systems of the developing world. Now I agree with them. I believe the iPad’s sleek user interface and ease of use will transform the ICT in education experience – but not for everyone. Yes, the iPad has great promise, especially since there are now thousands of apps that provide an almost limitless assortment of learning experiences through the touch screen tablet form factor. From simple acts like counting numbers and recognizing letters to reading interactive books and connecting with social media, it’s the wealth of digital content that keeps teachers and students engaged. Yet where is this content in the developing world? The iPad may be amazing when connected to iTunes in the English-speaking world, but it’s of limited use if there is no digital content. For example, the Wikipedia’s article count by language shows millions of English language articles, but the 8 million people Xhosa speakers – 20% of South Africa’s population – are served by only 118 articles in their language. And not a single iTunes app. There are a number of initiatives that seek to build educational digital content in local languages, and even ones focusing on developing content that aligns with national curriculum in the developing world. These efforts are nascent at the moment, though they are expanding rapidly as more electronic devices are present to access them. What isn’t growing, what is lacking are the skilled teachers that can take a digital device – any digital tool – and incorporate it into the classroom, into student-centric learning. Right now, the vast majoring of teaching that occurs in the developing world is rote memorization. This “chalk and talk” teaching instruction is often just transposed from analog to digital form when technology is deployed. In OLPC Peru, the largest 1:1 laptop deployment using XO laptops, students use their 400,000+ computers to transcribe texts from notebooks or chalkboards to their laptops. Are you surprised then that pedagogical use of the laptops has decreased among students and teachers over time? Teachers require training to understand how to teach differently. How methods like student-centric learning can be applied to the classroom, and shown how this learning style will increase educational outcomes. Yet who is investing in teacher training? If you look around, Ministers of Education get excited about shiny, flashy things, not human capacity building. And who can blame them? It’s a lot easier to show off a technology implementation than a trained teacher, and children and their voting parents can see a quick difference with a computer that isn’t so noticeable with a trained teacher. So regardless of how amazing the iPad is, until we invest in trained teachers who know how to use technology to improve their teaching activities, until we have parents and politicians focused on learning outcomes and not iTunes apps, regardless of how many apps or how easy the technology is, I fear that iPad educations in the developing world will be wasted. Written by Wayan Vota on April 21, 2011 in Tablet Computers in Education. Hi Wayan – thanks for pointing out just how much of a 1st world privilege the ipad is… Both in terms of language and cost I'd imagine. Actually the cost is a factor even for most 1st world schools, giving us time I hope to get out the change pedagogy first, then choose a device message. I fear you may be over-estimating the impact of teacher training in the western world. The United States spends more per capita on educational technology than any other nation on earth. It's not even close. While we can bemoan the lack of teacher training, it also has been relatively significant. The obvious question remains after all the investment in educational technology – where are the results? The USA is currently caught in a very public national educational crisis. Newspapers are publishing teacher ratings, schools are being closed and national academic standards are falling. It seems apparent that despite all the costly technology implementations, educational standards have fallen significantly. Why? In her study of how technology is used in industry, Harvard professor Shoshana Zuboff has identifies two distinct phases in the way new tools are implemented, calling them "Automating" and "Informating" (http://goo.gl/vmRkn). In the Automating stage, new tools are used to reinforce existing practices and processes. We see this stamped all over the educational space. Smartboards reinforce existing frontal teaching methods. Digital content replaces paper distribution. Technology speeds the efficiency of existing standardized testing. The essence and character of traditional educational practices however haven't changed. It's still "business as usual" in most American schools. – We see a society that values skills such as critical thinking, communication and creativity over the rote memorization of content. After all, the vast majority of content can be easily accessed within seconds on most mobile devices. – We value new literacies such as informational literacy that enables students to access, filter and evaluate the evolving mass of content now available. – We recognize an emerging global society where development of collaborative skills far outweigh the traditional demands that students sit still, listen and work only on their own. – We understand and value the use of text as a means of conveying information but also recognize that alternative medias are the language of new generations and their use needs to be encouraged in schools. – We feel the empowerment granted by new technologies and their ability to move us from frontal delivery of content to involving students in discovery based and interactive learning practices. The availability of technology is important and the value of having well trained teachers is vital. However that training becomes far more valuable when it focuses not just on the nuts and bolts of how to use technology and instead encourages teachers to dabble, experiment and re-imagine how technology can be used to create new educational horizons. A skilled teacher isn't one that just knows how to use a specific tool or technology. A skilled teacher knows how to utilize that tool to forge new educational paths for his/her students. It is the responsibility of our educational leaders to usher in this "second stage" of technology integration. The future is calling us. "any teacher who can be replaced by a computer probably deserves to be"
I would like consider two key issues – firstly the need to separate learning and teaching in this discussion. We must include the idea that what we are engaging with via technolgy and online communities and the various avaliable interfaces (moodles, MUDS, second Life, etc) are different to what is happening when we are teaching others. We are using tools to help us learn, moodles, online communities, second life and avatars, are tools to help us learn but do they teach effectively? Is it teaching? who is doing the teaching ? the designers of the interfaces? Google? Should it replace or should it be considered the same as face to face teaching time with students? I also want educators to consider how online learning and its technologies has shifted particular aspects of learner to a role of producer and designer of texts, and what this shift has done in terms of the learning and teaching culture. Incrasingly students need to be able to create and produce social and politically, economically important texts and engage with others to the betterment of a braod and global society – each country taking a positon in the world and economy and what ICT use changes in the very nature and culture of teaching may have an impoact on the countries and its future economy. Many Universities and some schools offer online learning courses which are often skill based, poorly monitored (there are many 'bots' on discussion forums that loop comments and advertising into discussion threads at timed intervals) – this is not cutting edge teaching! And secondly, the aspect of ICT in education sector and how it is changin the cultural environment in which the learning occurs. ICTs subtly reinforce a particular dominant cultural postion from which students produce and design their online texts and course understandings – often through the use of particular operating systems and particular tools. Increasingly these tools and systems reflect the values of the culturally dominant, digitally literate, white, male, middle classes (higher classes really – especailly if you need the latest laptops and apps to download your courses – an Apple for the teacher would seem to be appropriate here – but at what cultural cost?. Through the proliferation of online programmes in our schools and universities other courses that maybe more culturally sensitive, based on building negotiated relationships and utilise and practice human to human communication are sometimes ignored, marginalised or trespassed upon in teh eagerness of learning sectors to 'update' and 'future forward' their learning courses. Students with sophisicated and expensive ICT tools, those with sound online learning skills and access to broadband will be well served in the schools and Universities that push the on-line learning, technologically linked classrooms in hte 'brave new world'. But what is on offer to the increasingly marginalised in our society? what has happened to their right to access empowerment through higher education, on-line learning, technology assisted courses? …. is all too often they don't have the tools, the courses are unavailable in their homes and therefore education becomes unaccessible to them in a way that we have not seen in schools since the middle of the 1800s. "I would like consider two key issues – firstly the need to separate learning and teaching in this discussion." People always confuse Teaching, Studying, and Learning. And then they forget the Practice part of learning. Because it is Practice that makes permanent. To Learn something you need to be Taught by a teacher and you need to Study what you were taught. And after that you have to Practice what you learned. The use of ICT is different in every one of these situations. The issues that face developing countries using ICTs in education are very different from those in the Western world. In the Pacific, there is no formal training available for teachers on how to use technology to teach or to improve students learning. So we are not even educating the new teachers that are being trained right now and there is no teachers college in the region that offers professional development for teachers in the use of ICTs in the classroom. price of iPad is too high. Almost same from Samsung, Asus and Shenzen are selling at $ 100-200 range. Specs may not be the exactly same. But it is good enough for K12 students . Do not worry price of ipad will be down to $ 300*-400 within a year or two. So go to samsung and Asus. 2.- Education is needed by 7 billion people of the world. Contents with local language should not be considered at all.. Today everybody must speak English in they want to learn from internet if they want to be informed of the world and go ahead . Now it is even easier to learn online english from iPad and similar. 4.- Cost of online is only few pennies if youb share it . Share at a nominal price not free. The "School of One" in New York highlights so many of the possibilities related to "smart" teaching with ICT. This school is a fascinating example of the issues raised here by Wayan and I would encourage anyone interested to read the evaluation of their model that EDC produced in 2009. The students' individualized instruction plans are produced by a "Learning Algorithm" that the teachers plug with data. This in turn leads the teachers to come up with individualized "playlists" of lessons that meet the students' abilities and interests at the needed pace. Although this model would not work in many places, it does provide important details on the resources and inputs required for cutting edge integration of ICTs and truly "smart" teaching. I think iPads and other devices on the tablet platform show great promise. However, I think a great deal of this promise is not examined in context. Three factors need to be in place for a platform of this nature to scale in new emerging markets across the developing world. 1. The Infrastructure – Even iPads need to be powered up. There's little access to grid power and green energy is expensive in rural Africa. That said, a family has to decide whether to use the little money they have for a solar pack to power a (probably donated) tablet or by flour. 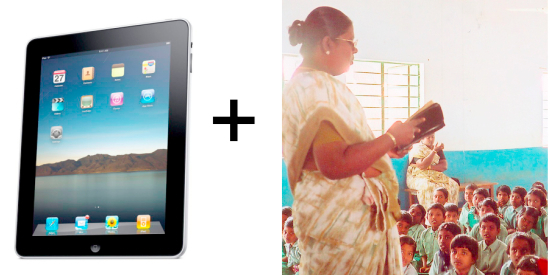 Distributing tablets at a huge cost to taxpayers in developed and developing countries is the easy part. Once the device is powered up there's a need to download content onto it. While mobile penetration and coverage is pretty good in Kenya for instance, the same isn't true of Malawi. The danger of tablets in rural Africa that can't be powered up and onto which no content can be downloaded would seriously undermine any efforts. 2. The Technology – Tablets have come a very long way very fast. However, I am yet to see one that can take the punishment of a school child's school bag, dust and fluid damage. M-Edge have made admirable attempts but theirs is a retrofit solution. I would love to see devices that are built from the ground up to be rugged. Devices that are not designed for the realities of rural Africa will need to be replaced or repaired extremely often. This is really just a design challenge that can be easily overcome but one that needs research to solve properly. 3. Content & Curators – Publishers in Africa have been characteristically suspicious of digital publishing and content for these platforms is as digital as it gets. However, getting content created or ported to this platform and distributed somehow is probably the easy part. How do teachers (the curators) use the technology to help children learn better? Not enough attention is being paid to this (in my pedestrian opinion) and yet this is one way to keep this kind of technology from becoming the new XO. And here, I belabor your point on Teachers are best. In some countries or counties or schools, it might be tablets that become the preferred platform. In others it might be the XO. In others it might be the good old PC and still in others the paper and pen. While exploring the potential technology has we need to ensure teachers can teach best with whatever technology they have to use wherever they are. Who knows what new device platform will evolve into the next pen and paper? Teachers will be still here, invest in tech that helps them become better at teaching. I am a big fan of teacher-facing ICT4E. In the tablet arena, I saw a presentation by David Stevenson of Wireless Generation and I came away duly impressed. Their teacher assistance ICT was amazing – real time student evaluations that can be acted upon and shared with administrators and parents. In fact, it was that presentation that was the genesis of this debate. I agree that the teacher is the best investment. The challenge in Kenya and probably the rest of Africa, from my perspective, is base level digital literacy. It is clear that the efforts towards empowering the teacher to then impart this knowledge to students has been noted as the best direction to usage of technology in the classroom. Intel has been instrumental in putting together the Intel Teach Program, and working with government globally, and here in Kenya too. I have also seen efforts by Microsoft through their Citizenship program to scale ICT knowledge. UNIDO too has several running programs that are moulding teachers. I don't see base level digital literacy as a goal worth aspiring to, in the same way that I don't aspire to bridge the Digital Divide, but to fill it in, to obliterate it, to make it a fading memory. "Digital literacy" has failed dismally in the US, in much the same way that a literacy program with books, pencils, and papers in only one room, to be used one hour a week, but not for homework, would be a dismal failure. What we in the One Laptop Per Child movement aim at is integration of computers into the entire curriculum, including every school subject and everything else that the student considers worth learning. The computer can be a tool for learning, a mental amplifier, and a means of sharing and collaboration for all children everywhere. And in addition to that, they can teach some of this to their parents and grandparents. @mokurai: I am very sympathetic with your devaluing of "base level digital literacy", which seems like an endless quest to stay behind the curve. And I value the OLPC approach, as an aspiration and a goal worth advancing. But there is a complementary approach which can take while connectivity and hardware are scarce. In BOSCO-Uganda's web 2.0 training approach, the computer isn't introduced first as a keyboard, then a platform for outdated software, etc., but rather as a portal for global collaboration. As long as someone in your group can manage keyboarding, a whole group of students can collaborate globally on issues of importance to them. We've referred to this approach as the turning of traditional ICT training on its head. This is a just-in-time approach to learning, rather than a just-in-case. On this approach, by the time students achieve OLPC, they'll already be acclimated to the collaboration portal in front of them. PCs-for-everyone will remain relatively expensive, but the cost of initial and valuable connectivity can be overestimated. Wireless, solar-powered access can affordably leapfrog traditional infrastructure, and in many cases it should be considered as a way to prepare the way for OLPC. Yes, I do agree that empowering the teacher is the most important next step towards ICT in Education . We are very active in providing teachers a tool to enable themselves to create their own contents. The entire global use of ICT in education has been slow because of this factor. Teachers even in developed countries are still using the outdated blackboards mostly. I have proposed that the Replacing Textbooks project at Sugar Labs create lesson plans for students to work on Wikipedia pages in their own languages. This could be translating from other languages (for more advanced language students), adding pages with local content, or fixing pages that need help, for example with better references. To begin with, a class can be assigned the same page, and the best suggestions can be merged into a class edit. Later on, students can be assigned to choose a page needing help, with a requirement to document the help needed, and why the student is prepared to provide that help. There are many other possibilities. The same can be done at Wikiquote, Wiktionary, and so on.